Just Jingle: The Christmas Village by Melissa Ann Goodwin - Review and Giveaway! The Christmas Village by Melissa Ann Goodwin - Review and Giveaway! I am so excited to share this with you today! As some of you may know, I used to be a teacher. I loved it. Given the opportunity, I would do it again in a heartbeat. The part of teaching I loved the most was watching as students learned how to read. I collect children's literature and find that there is nothing more magical than a wonderful story and a child discovering that story and all it has to offer. So...when Melissa Ann Goodwin asked me if I would like to review her book and give a copy away on my blog, I JUMPED at the opportunity! When Jamie Reynolds comes to his grandparents' Vermont home for Christmas, he just wants things to go back to the way they were before his dad disappeared. Time and again he is drawn to Grandma's miniature Christmas Village, where he imagines that life is perfect. Late one night, the village comes to life before Jamie's eyes, and his fantasy of escaping into it becomes very real indeed. He discovers that the village is called Canterbury, where the year is 1932. Jamie becomes fast friends with Kelly and Christopher Pennysworth, and is taken in by Ida, who runs the local boarding house. But he also makes a dangerous enemy of the mysterious and menacing Jim Gordon, whose return to town is nothing but trouble. As Jamie desperately races against time to find his way back home, he is suddenly faced with a terrifying choice: to go ahead with his plan to leave, or to stay and help his friends, at the risk of never going home again. 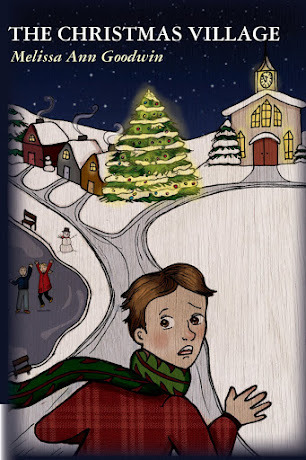 The Christmas Village is an adventure the whole family will love, filled with suspense, secrets and surprises to the very last page. You don't want to miss out on this wonderful book! You can find it on Amazon and Smashwords (ebook version). A few small local stores also carry the book. You can find those on Melissa's blog, as well as the Christmas Village Book blog. If you happen to live in Massachusetts, Melissa will be doing a book signing on November 12th at the Andover Book Store in Andover, MA. She has another signing scheduled at the Santa Fe Children's Museum in Santa Fe, NM on December 11th. Would you like to win a copy of The Christmas Village by Melissa Ann Goodwin? Well, you are in luck! I've got one to give away! To enter, please visit Melissa's blog and come back and leave a comment about something you read there that you found interesting! Check out this review of The Christmas Village and win a copy of your own! @GoodwinMelissa @JustJingle http://tinyurl.com/3jj7nqu Please RT! This giveaway is open to US and Canada only. This giveaway will end Thursday, November 10th 2011. I was provided a copy of the book to review. All opinions expressed are my own. Hi, just popping in to say hi, thanks for the chance to win! Sounds like a great book to read with my eldest, the bookworm. I've always harbored a secret ambition to publish a children's book, so I really enjoyed reading Melissa's posts about meeting with her agent and the whole writing/editing process. this is great! I'm always on the lookout for good children's literature. I visited Melissa and found the Creatspace article interesting--didn't know about those services. Sounds like a wonderful story...could be a Christmas classic for my family (esp. my niece)!! Did not know that there was a service like Createspace...good move, Amazon! LOL!! Another fact on Melissa's blog, the book will be available in ebook format (me + Kindle = HAPPY!!). oh what a great giveaway! I love reading to my kids and this looks like a wonderful book. her blog is great! I would love a chance to win this book for my grandson! I visited Melissa's blog and was surprised to learn that she is from New England. New Mexico is a huge distance away from her roots! Sounds fantastic~what a cool give-away!!! This will make a great gift for my godchildren. Thanks for sharing. Hello Everyone! First - thank you Jingle for the wonderful review - I'm so glad you liked it! It's a wonderful feeling when people express exactly the sorts of things you hoped for when you wrote it!! And, pleased to meet you all. Thank you so much for stopping by and leaving comments. I look forward to visiting your blogs and getting to know you as well. the book sounds fabulous and so perfect for my middle school kids! I like Melissa's thankful thursday, my friend does that on her blog too. OMG! I want that book so badly!!! SERIOUSLY! I love ANYTHING Christmasy, and happy-ever-after Christmas stories rank SUPER high on my list! I went to (and bookmarked) Melissa's blog, and what I liked was her idea to write the things for which she is grateful. If you have been to my blog, you know I recently addressed the GRATITUDE ATTITUDE as well! I don't 'do' CREDIT OR PAYPAL so, because this book isn't available at Barnes & Noble where I can just pay cash, I am keeping my pudgy fingers crossed that I win this!!! Thank you for adding me to the drawing, Jen! I just LIKED you BOTH on Facebook. I like you HERE, too. I would like you on a train. I would like you in the rain. I would ... huh? Dr. WHO? Oh, yeah. No wonder that sounded so familiar. Heehee! Kai, you're hilarious! I saw your note on FB too- thanks for coming by. Wishing you very good luck, and thinking about a Plan B if you don't win...I have a private stash of books so let's talk if it comes to that - okay? I love your enthusiasm and I'm glad we share that gratitude attitude. I'd like YOu on a train in the rain too! this really does sound like a wonderful story! interesting fact from Melissa's blog-even famous author's wear warm, bear covered socks! yay! Hi Diane - thanks for saying hello. I hope my book brings lots of smiles to faces young and old. Today I'm grateful for all the nice people I've met on Jen's blog. I am now following Melissa on her FB page - left a comment. She looks so cute and sweet! Wish she was coming to Utah for a book signing :) Thanks for the chance to win a copy of this book - I need it! Hi Becky, thanks for coming by on FB and my blog! I left a note on yours too - a book signing stop in Utah next year is not out of the question! I love books! This is what I found interesting on her blog: she grew up in New England town of Andover, Massachusetts! thanks also for a chance to win! I like to cover art on the book. To me, the art of a book is just as important as the content. following u both on twitter. I'm glad you liked the cover -I am really pleased with it. I agree - a book cover is very important! i learned that Melissa is of English heritage and her mom was born there and then came to the US. The story of her mother was very interesting. Reminded me a little of the Pevensey children from The Chronicles of Narnia. Sounds like the perfect level for my sister. I like the clean design of her blog. It was so easy to find all the information about the book, right there on the side bar. Was happy to learn that this book is available in e-book format.